I'm looking for help about using custom icons and buttons. In Trumba® Connect, you have a granular level of control over the fonts and colors that appear in your published calendar views and other spuds. In each publication's Publishing Control Panel, you have the opportunity to set global styles that apply across spuds as well as the ability to override any global setting on an individual basis. If I set up one publication the way I want, can I copy its settings to other publications? Setting global styles puts a style foundation in place across all of the spuds you create. While you can always modify settings on a spud-by-spud basis, starting from a common foundation saves you a lot of time. An overall font scheme for all of your calendar views and other spuds. Fonts, text sizes, and text colors used on the base page and in headers, groups, subgroups, and featured events. Button background and text colors used for paging, sign-up, and event actions panel buttons; day of the week headings on the Date Finder and month views; and the month heading on date icons. Link and hover colors and decorations (underline versus none) used on the base page and in featured events. Borders and/or background colors used on the base page and in groups, subgroups, and featured events. 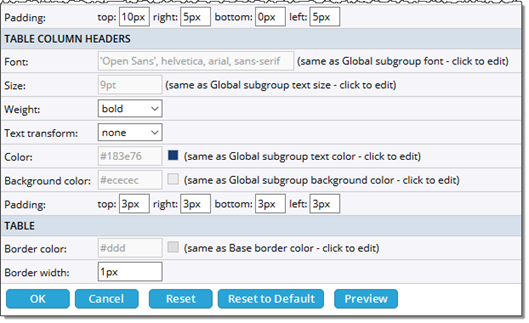 Base page refers to a set of underlying font, text, and color settings that carry across all of your spuds. You can modify any of these settings for each individual spud. Groups and subgroups appear in your calendar if you use a table- or list-based view and set event grouping and subgrouping. The global style settings are great, but more than I need. Can't I just apply a pre-designed font scheme and call it good? In the Trumba Connect editing environment, select the publication to which you want to apply global styles. Click Publish. If you haven't already published your calendar, on the Publish page, click OK. In the Publishing Control Panel, click the Publish Settings tab. Click Edit Styles & Icons. Select the font or font combination you want to use. Does the Custom Font Script field mean I can use a custom font? Tip If you change the font scheme after you already customized styles for individual calendar views and other spuds, the global changes overwrite the spud customizations. In the other sections of the Edit Settings for Global Settings page, use the text fields and Color Picker to set the base page, rounded corners, header, group, subgroup, and featured event settings you want. Is there a quick way to import my organization's color palette? Tell me more about rounded corners on control and promotion spuds. It can be tricky to know exactly what aspect of your calendar and other spuds a specific global style affects. After you select a setting or two, click Preview at the bottom of the page to see the settings in action. When you're satisfied with the global settings, click OK. If you use non-standard fonts for your website and you want your Trumba spuds to use the same fonts, you can apply custom fonts as base styles. To use a custom font, you have to take advantage of a web-based font service, such as Adobe® Typekit, Adobe Edge Web Fonts, or Google Fonts. On a font service site, when you select the font you want to use, the service provides you with a font tag and the font-family name. You need these two pieces of data to set up custom fonts in Trumba. Keep in mind that using custom fonts may add to the time it takes for your webpages to load. Custom fonts you set on your global settings page are applied to all of a publication's main calendar, promotion, and control spuds. They are also applied to event submission forms. Custom fonts are not applied to calendar and event emails. Go to the website for a web-based font service and select the font you want to use. In the Trumba Connect editing environment, select the publication to which you want to apply the custom font, and then click Publish. Note For link type font tags, it's a good idea to remove http: from link tags to allow the fonts to load safely on pages accessed with either http or https protocol. Tip When setting spud styles, if you don't notice a difference when you set the font weight to medium (e.g. for event titles), you may need to add the "500" value into your custom font script, as shown in the example above. Note: You'd need to replace 'your-kitID' in the code sample below the with ID you attain from the font service provider. The kitID is blurred out in the screenshot below the code sample. Back on the font service website, copy the font-family name. For Google Fonts, the font-family name looks something like this: 'Open Sans'. For Adobe Typekit, the font-family name looks something like this: 'Museo-Sans'. Tip Copy just the font name itself, surrounded by single quotation marks, without including the semi-colon at the end, such as: 'Open Sans' or 'Museo-Sans'. In the other sections of the Edit Global Settings page where you want to use a custom font, paste the custom font-family name from step #7 as the first font, separating it from the other system font names with a comma, such as in the screenshot below. Paste the font-family name into font fields as the first font. Note: If you receive the error, Base font: invalid font set, you may have copied in "curly" quotation marks. To replace them with straight quotation marks, delete and then re-type them within the Trumba Connect editing environment. At the bottom of the form, click Preview to see how the custom font looks in the calendar, promotion, and control spuds you've added. Tip If you don't want to use the custom font in specific spuds, you can edit the spud settings, and remove the font-family name from the font fields. Learn more about editing spud settings. To save the custom font settings, at the bottom of the form, click OK. 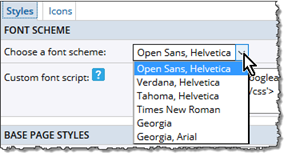 Tip You can use more than one custom font in a publication by pasting more than one font tag into the Custom Font Script field, and then applying each font-family name to the appropriate font fields. However, the more custom fonts you add, the slower the page load times. When you're setting global styles (and customizing individual spuds), you select text, border, and background colors using the Color Picker. Setting up your calendar styles is a lot easier if you understand how to get the most out of this powerful tool. Tip To save time, use the Color Picker to set colors at the global level before you apply them to individual spuds. When you first open the Color Picker, you see a color palette under Top Colors. This palette comes from the color scheme that is selected at the top of the Edit Global Settings page. Where do I find the Edit Global Settings page? Color Picker with default color scheme outlined in red. 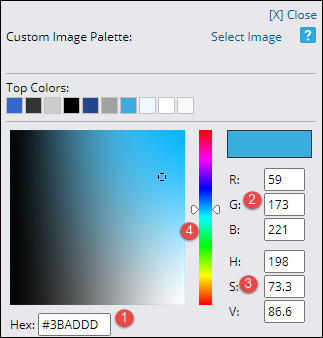 You can select a color for an individual style setting (for example, the base text color), by typing the color's hexadecimal (1), RGB (2), or HSV (3) value. You can even type a color name in the Hex field (1). Or, you can use the color slider and thumbnail to select a color visually (4). If you use the same color a few times, the color is added to the Top Colors list, where you can apply it by clicking the color square. The list can include up to 16 colors. Tip Double-click a color square to apply the color and close the Color Picker. Most likely, your organization has its own color palette that you use to brand your website and other publications. If you have a logo or other image that includes some or all of your palette's colors, you can use that image to add your custom color palette to the Color Picker. To bring an image's colors into the Color Picker as a custom palette, click Select Image, and then select New. After you locate and name the image, the image colors appear in the Color Picker under Custom Image Palette. Your custom palette can include up to 16 colors. To apply a color to a setting, simply click the color square. 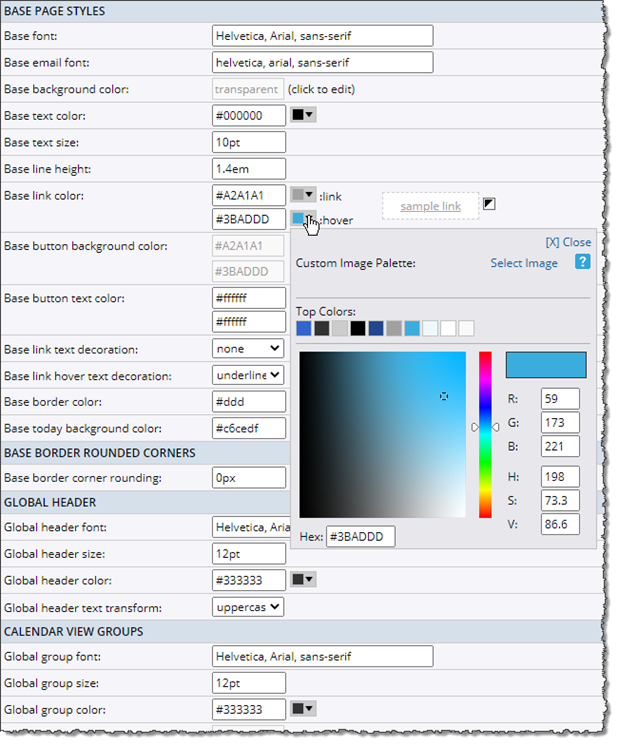 After you apply your custom colors to global settings and save the Edit Global Settings page, colors from your custom palette replace the default colors under Top Colors. To apply a color, you can click (or double-click) its color square in either the custom palette or top colors list. 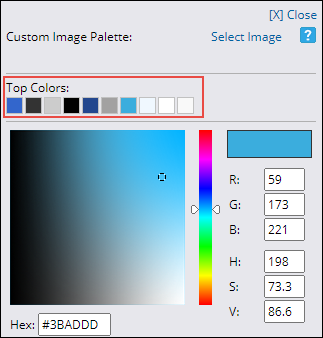 As you apply them, custom palette colors replace default colors in the top colors list. If you set styles at the global level, calendar views and other spuds inherit most of the global style settings. This saves you a lot of time as you only have to touch a few individual spud settings when you want to override the global values. Tip Global style settings DO NOT affect event colors. By default, event colors originate with the calendar color choices you make in the editing environment. You can change the default event colors if you want. How do I know when a setting is inherited? The following image shows a section from the Edit Settings & Styles page for a Classic Table calendar view. Inherited settings show grayed out text in the text boxes as well as a "same as Global [setting]" note. You know a setting is inherited when its text is grayed out and it is annotated with a note. How do I override inheritance? When you're editing an individual spud's styles, you can override any inherited setting by clicking the setting's text box or color square. To override an inherited setting, click in a text box or click the color square. The text becomes editable and the Color Picker icon active. In addition, you see the inheritance button ( ) to the right of the Color Picker icon. To revert to the global setting, click that button. Tip If you customize individual spud font and color settings and then, at the global level, change the font scheme, the individual spud settings are overriden. However, you can change individual global settings without affecting spud overrides. More about global settings. After you set a publication's global styles, you can customize styles for each of the publication's spuds on an individual basis. In the Trumba Connect editing environment, select the publication with spuds you want to customize. Click Publish. Tip If you haven't already set global styles, do that now. In the Publishing Control Panel, click the tab for the type of spud you want to customize. Calendar view spud, click the Calendar Spuds tab. Control spud, click the Control Spuds tab. Promotion spud, click the Promotion Spuds tab. Calendar or event email, click the Email tab. Before I can customize spuds, I need to know how to add them. I need an overview of calendar and event email. Click Edit Settings & Styles at the bottom of the spud. On the Edit Settings page, on each tab, find and customize global style settings you want to override and styles unique to the spud that you want to set. You might want to review the information about style inheritance before you start customizing. After you make a couple of changes, at the bottom of the page, click Preview to see the changes in action. When you're satisfied with how the spud looks, click OK.